The Neighbourhood - Now Renting! Norwood Village Apartments are located on the west side of 95 street between 113th and 114th Avenues in the beautiful tree-lined neighbourhood of Norwood. This mature neighbourhood has been bustling with a renewed vibrancy in recent years. The building is just steps away from the award winning 118 Avenue revitalization and the many exciting festivals, such as Kaliedo and The Deep Freeze which take place there. The neighbourhood is also home to many unique independent restaurants as well as one of the City’s only year-round farmers market held every Thursday. Priorities for families include playgrounds, daycares and schools and Norwood Village Apartments hit the mark on all of these. 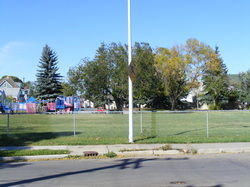 Norwood Square Park is located just across the street and provides plenty of space for running and playing as well as a playground. There are public and separate schools located nearby, the closest being Norwood Elementary School which is just two blocks away. For those with little ones, there will be a daycare located right in the the building making pick-up and drop-off a breeze.